A tasty pesto can be made with the combination of any greens and nuts plus some garlic, Parmesan cheese, and olive oil. Create your own tasty combinations using your favorite greens and nuts. Lettuce leaves are another green that makes a delicious pesto. Any lettuce leaves will work including baby spinach, kale, or any small greens. The only exception is Iceberg lettuce – the water content is too high to use and it will make a watery pesto. Add the lettuce, garlic, herbs, ¼ teaspoon salt, ¼ teaspoon pepper, and cheese to a food processor then pulse until finely chopped. With motor running, add the oil in a slow stream, using only ½ cup. If a more fluid consistency is desired, add more oil, a tablespoon at a time, and blend until incorporated and the desired consistency is achieved. Add salt and pepper to taste. Store in the refrigerator for one week or in the freezer for 6 months. Serves 6. I’m very interested in this recipe! 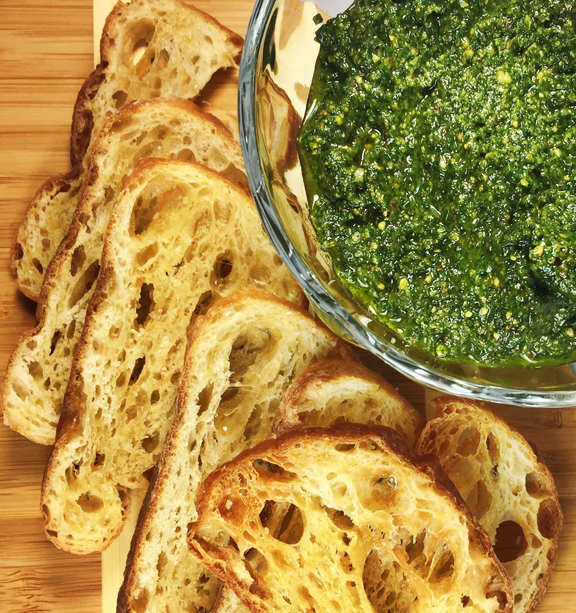 I love pesto and always wanted to try making it at home! We hope you enjoyed the recipe!